Numix – get crazy about adding numbers! Numix is the newest game for iPhone that is an absolutely must-have app for anyone passionate about fun games to play on the iPhone – i.e. every iPhone users out there really! When making a sequence of numbers that you would like to add the last number in the sequence has to equal the sum of all the previous numbers of this sequence. For example, you can add make a sequence such as 5+6+11 and receive 22 points for your total score, because 5+6=11 and 5+6+11=22. However, you cannot add a sequence such as 5+6+12, as 12 ≠ 5+6. Furthermore, a sequence can never contain the same number twice. For example, you cannot make a sequence 5+6+5+16, because it contains the number 5 twice. 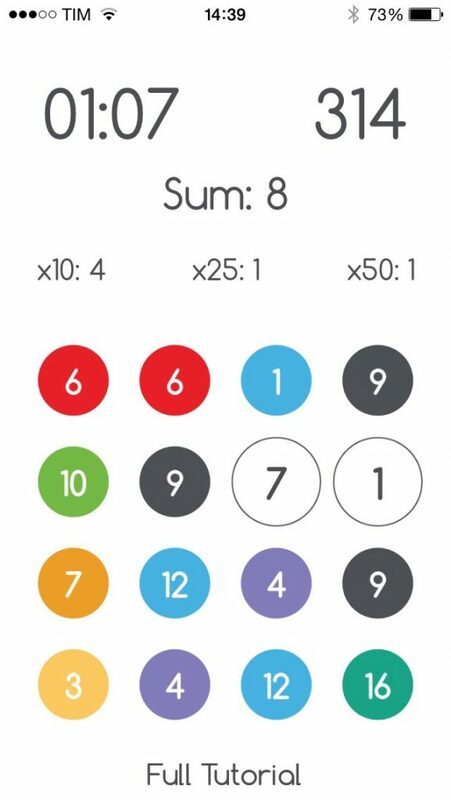 However, you can add only the same numbers together, i.e. 4+4! In this case 8 is added to your matrix as a new number that you can use in following sequences. It does not get added to your total score. The higher the sum of your sequence, the higher the bonus points at the end. Hence, players are encouraged to make extra long sequences, with more and higher numbers, to receive more bonus points, as well as to add more point to the final score! Lastly, Numix can be played online and offline. Online each player can play against other players on the net. Each game between two players consists of three individual games and the player who wins the most games wins the overall game. Numix was created on the online platform MakeItApp, where people can meet online and create apps together! Via MakeItApp users can form groups to create apps together, by sharing their skills, knowledge and ideas with others. The use of the website is always free and producing an app is too! The future revenues of a completed app will be shared between all the team member that have helped to create an app. The MakeItApp Staff takes care of Marketing and Promotion of the App. Interested? Find out more and register for free here: http://www.makeitapp.eu!